The next meeting of the Society takes place on Thursday 14th January 2016 at 7:30 pm in St. Andrew’s Church, Bilston Street, Sedgley. Members and visitors are invited to raid attics, cupboards and bookcases for those well-thumbed treasured pages. The shelves are creaking under the weight of the printed word. Look for books of all kinds, sports programmes, old magazines and childhood comics. The evening is a great chance to display items and chat about them. Start the New Year by sharing your memories and ‘treasures’ at this friendly gathering. This road cuts through three of the Sedgley Manor villages. Although easy to name, other details of the highway might need some research. Over 10 miles long, the A4123 dual carriageway joins Wolverhampton to the Birmingham boundary. 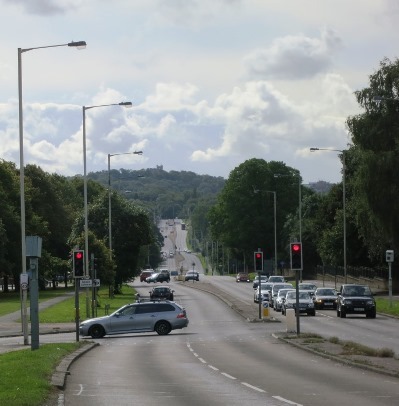 It is usually called the Birmingham New Road and locally passes through Ettingshall, Coseley (where the photograph was taken) and Woodsetton. The �0,000 scheme was awarded to McAlpine & Sons. Construction began early in 1924 and found work for hundreds of unemployed soldiers who had returned from the First World War. On November 2nd 1927 the Prince of Wales (later, and for a short time, Edward VIII), ‘opened’ the road, not once, but eight times at ceremonies in Quinton, Halesowen, Oldbury, Rowley Regis, Dudley, Tipton, Coseley and finally Wolverhampton!